The Door’s Summer Arts Intensives are 7-week-long training programs that aim to expand upon young people’s artistic capacities and creativity, broaden their awareness of the arts, and encourage them to recognize collegiate and professional opportunities in arts related industries. Intensive curricula are characterized by the development of valuable life skills that are useful both on and off the stage. Classes emphasize process over product through a holistic instructional approach, including technique, personal development, health and wellness and career exploration. Interdisciplinary reinforcements are integrated into each program over the course of the summer from The Door’s Counseling, Legal, Adolescent Health and Career & Education departments. Instructors are practicing artists who teach from within a mentorship framework, providing individual support to participants, as well as and first-hand experience of navigating the New York arts scene. Time is dedicated for youth to attend off-site performances and to visit professional arts venues and schools. Additional support is provided in specialized skills, including portfolio development, auditioning, marketing and branding. At the end of the summer, young artists have the opportunity to present their original works at some of NYC’s top arts venues. The Summer Arts Intensive experience is a unique opportunity to connect youth to community resources and cultivate lifelong learning. The Summer Dance Intensive is for aspiring dancers who are dedicated, disciplined, and dance with a generosity of spirit. Young people are taught a variety of genres, including Ballet, Jazz, Contemporary and Hip-Hop Dance. The Summer Music Intensive provides a solid musical foundation that encourages confidence, creativity, independence, and artistic collaboration. 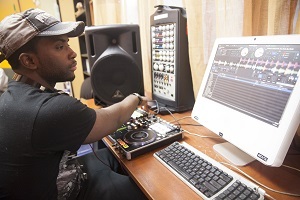 Topics include Vocals, Emceeing, Songwriting, Audio Production, Engineering, DJ’ing and Ensemble Work. 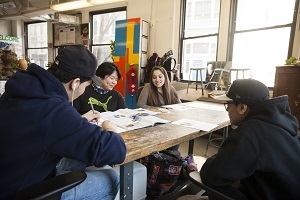 The Summer Visual Arts Intensive is designed to explore the depth of shape, color, line, texture, and space, as well as the importance of conceptualism to help students develop scholarship level portfolios in Fine Art, Graphic Design, Videography and Fashion. Have you heard our tunes? Check out our newest LP online now!